Catch the spirit with our great stadium blankets. 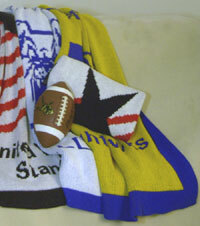 We can design an afghan for your school team/club in your school colors. Browse through our gallery to see some of the designs we have done. Made out of top quality acrylic. Measures approx 36"W x 56"L. Discount pricing available for fundraisers.